This review is part of the Discover Aussie Fantasy feature, running during July on The Oaken Bookcase. You can find details of the feature and enter the giveaway on the Aussie Fantasy page! Rollrock island is a lonely rock of gulls and waves, blunt fishermen and their homely wives. Life is hard for the families who must wring a poor living from the stormy seas. But Rollrock is also a place of magic – the scary, salty-real sort of magic that changes lives forever. Down on the windswept beach, where the seals lie in herds, the outcast sea witch Misskaella casts her spells – and brings forth girls from the sea – girls with long, pale limbs and faces of haunting innocence and loveliness – the most enchantingly lovely girls the fishermen of Rollrock have ever seen. But magic always has its price. A fisherman may have and hold a sea bride, and tell himself that he is her master. But from his first look into those wide, questioning, liquid eyes, he will be just as transformed as she is. He will be equally ensnared. And in the end the witch will always have her payment. Note: This book was published by Allen and Unwin in Australia as Sea Hearts, but is named The Brides of Rollrock Island overseas. I’m not sure why my library had a UK edition but that’s the one I’m reviewing. Published: Sea Hearts published Allen and Unwin, February 2012. Published in the UK by David Fickling Books Feb 2012, in the US by Knopf Books September 2012. The Brides of Rollrock Island is a dark fairytale concerned with the consequences of dealing with witches. It’s a strange book – rather slow moving, but the writing itself is very beautiful with lyrical descriptions that put you right into an exposed seaside town. The story is told from several points of view throughout the book. Firstly, the story of the childhood of the sea witch Miskaella is told, and of her discovery of her powers. She is treated terribly by the townsfolk on Rollrock Island and when she discovers a way to bewitch the men of the island, she is delighted. Thus follows the stories of various families of the island as the men-folk succumb to the lure of the beautiful sea wives Miskaella is able to summon. These are no run-of-the-mill mermaids, mind you – these are Selkies, beautiful and ethereal women called to human form from their seal-forms. The men cast aside their own wives, and hide away the seal-skins so that the seal-women cannot return to the sea. Make no mistake, this is no happy story – just about everyone in the story is desperately sad most of the time, except perhaps for Miskaella and her apprentice Trudle who take an evil delight in everyone else’s misery. The menfolk of the town seem very easily enchanted. Is the magic that strong or is Margo Lanagan trying to show that all men are fickle and weak-willed? Either way, the treatment of the human women on the island did leave a bad taste in my mouth, but I suspect that was the intended reaction. Time and again I must force myself to see that no actual wind frayed or bent the air. I feared that at any moment I would be caught up bodily and thrown high away, or dissolved grain by grain up into this invisible wind. Surely my mind would break soon from seeing this, from seeing through the skin of things to the flesh and the bone, to the breath gusting through and the blood pouring about? I would die of it, or fall into some kind of terrible fit. For the first time I was seeing life truly, and the truth would overwhelm me; a person couldn’t bear this sight for long – a girl of nine should not be expected to bear it. Look at the power all but bursting from every cobblestone and grain of grit between! See how it was loosed in dribs and drabs so measuredly, moss crawling there in a corner, a schoolboy here running along his lane to join us, his greetings peeping within the roar-that-was-not-a-roar. Oh, the sky! I was glad of the clouds, the glowering light, for they seemed to my timid eyes to contain this ongoing event, though another, fresh-born, braver Misskaella behind those eyes knew that cloud of clearness was nothing to the purposeful flaring. It would leap regardless, pushed on outward by the forces from below. 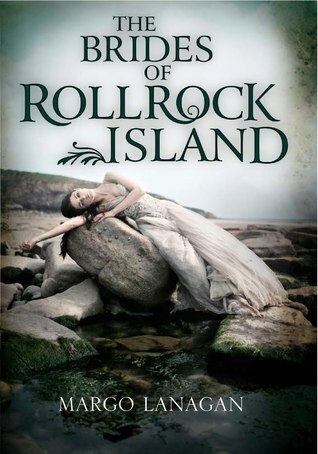 If you’re looking for an unique and beautifully told fairytale, I do recommend The Brides of Rollrock Island, but perhaps steer clear if you’d rather not read a depressing story! 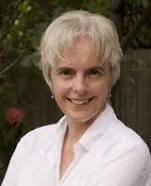 Margo Lanagan, born in Waratah, New South Wales, is an Australian writer of short stories and young adult fiction. Many of her books, including YA fiction, were only published in Australia. Recently, several of her books have attracted worldwide attention. Her short story collection Black Juice won two World Fantasy Awards. It was published in Australia by Allen & Unwin and the United Kingdom by Gollancz in 2004, and in North America by HarperCollins in 2005. It includes the much-anthologized short story “Singing My Sister Down”. Her other fantasy works for younger readers includes the award-winning Tender Morsels. I really must read this one soon! While not a fan of depressing, I am highly intrigued with this book. And THAT COVER. Honestly, it may be one of the best covers ever. And the book just sounds very creepy and dark and sad… lonely. I loved your review. I want to read it, but don’t know if my heart can take it~! Though I do much prefer this UK title & cover! I’d need to be in a particular mood to be reading this though, from the sound of it.